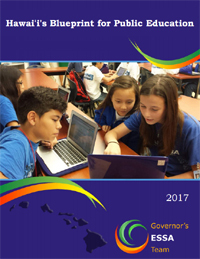 In May 2017, Hawaii Governor David Ige’s Every Student Succeeds Act (ESSA) Team released the final draft of “Hawaiʻi’s Blueprint for Public Education” (version 2.0). The Blueprint is organized around three “Vision Focus Areas” – Student Success, Educator Success, and System Success. It was developed by a team of 19 appointed members and includes feedback from over 20 town hall meetings and community forums over the past year. * An executor or an innovator. The Hawaii Board of Education’s new Superintendent, Dr. Christina Kishimoto, starts on August 1, 2017. I’m not sure whether it’s better to have a new blueprint ready for a new superintendent, or if we should have waited for input and guidance from the new superintendent. * High expectations vs. realistic goals. We need to find a balance between high expectations and achievable goals. Unfortunately, some of the objectives are simply unrealistic. We can’t mandate public opinion, because we are all independent thinkers (“Our most qualified college students and graduates will regard the profession of teaching as a desirable aspiration and dedicated, qualified teachers will teach all public school students by 2020”). We can’t have 100% parity of achievement, because we all have different abilities (“The achievement gaps in learning will begin closing in 2017 and will close by 2020”). We can’t control the efforts and successes of other states (“Hawaiʻi will be acknowledged as having the nation’s top public education system in 2025”). * Early education starts at home. The Blueprint acknowledges, “Families are a child’s first and lifelong partner in education. Therefore, schools will embrace families by engaging them at the earliest possible stage in their journey to be true partners in their child’s development and learning.” I think that public education should focus on current responsibilities (K-12 and adult education), instead of taking on more responsibility and duplicating existing efforts by the Department of Health and nonprofits. Parents should decide whether their children are ready for preschool. * Could you predict your future in elementary school? The Blueprint calls for “Implementation of a new comprehensive system of pathways will be provided for all students beginning in elementary school. Pathways will guide all students who aspire either to traditional colleges or post-secondary career and technical education.” Few of us know our career path or interests in elementary school. This focus could lock students into a particular “path” or subtly direct students toward a particular path that won’t fit them when they are older. What about pathways to public service, entrepreneurship, or military service? * A lot of thought in BREATH and fern. Nā Hopena A‘o (HĀ) is “a framework of outcomes that reflects the Hawaiʻi Department of Education’s core values and beliefs in action throughout the public educational system.” These core values and beliefs are a sense of Belonging, Responsibility, Excellence, Aloha, Total well-being and Hawaiʻi (“BREATH”). I have to wonder how long it took to come up with this acronym. Similarly, there was a lot of effort dedicated to the meaning of the logo, a Hāpuʻu fern – the symbolism, color, and shape. Whether or not you have school-age children, I encourage you to read the Blueprint for yourself and submit your comments to the ESSA Team – and share them on Better Hawaii. What do you think about Hawaii’s public education goals? Do you agree with their priorities and strategies? For parents and students, it’s a few weeks into the new school year. My son started fifth grade at a public elementary school in Honolulu, and the start of this year has been harder than in previous years. The start of fifth grade was harder for me too. My school had combined fifth and sixth grade classes, so we had the same teacher, Ms. Foster, for two years. We had the chance to have a mentor in fifth grade and be a mentor in sixth grade. Here’s what I remember most: we still had snack time (milk and cookies or brownies). We had a classroom economy, with a banker and checking accounts. We had daily one-page writing assignments (I even wrote a few stories with cliffhanger endings that were resolved on Fridays). Today, I think we expect so much more from students (and we took away snack time). The back-to-school experience is all about more. More school supplies. Shopping for school supplies is like a treasure hunt. This year, the list was 33 items long – among them, 24 sharpened #2 pencils, hand soap, tissues, wet wipes, various markers, and a white board. I don’t mind paying for school supplies (after all, everyone in Hawaii helps to pay for public education), but I wish there was an easier way to do it. One solution is to bundle all the school supplies and charge a flat fee. Buying in bulk could save parents time and money. It could be convenient for donors, who could contribute a backpack or buy a school supply kit. It could also be easier for donor organizations, which would not have to store and distribute an assortment of school supplies. More school forms. School paperwork has multiplied over the years. We fill out emergency cards, MealTracker (school lunch) deposits, a responsible technology agreement, a media release, a free/reduced lunch form, a PG movie viewing release form, a volunteer form, and field trip consent forms – not to mention the forms to sign students up for optional extracurricular activities. I understand why the Department of Education (DOE) needs all of these forms, permissions, and disclosures. Really. But it’s overwhelming for parents to fill out these forms; and it’s time-consuming for administrators to create, copy, distribute, collect, and file these forms. Every year. One solution is to create online student accounts, so that parents can fill out forms online. Parents could input their information once, and then update them every year. Data could be transferred to the school database, with fewer data entry errors. At the beginning of the school year, schools could even open up their computer rooms in the evening or on a weekend, so that parents without computers could fill out the forms, assisted by administrators. More homework. I know that teachers give different amounts of homework, but my son’s workload has increased this year. His daily homework consists of reading for at least 30 minutes, two pages of math, and a page in the “Reading Wonders” book. Side note: when I was in school, I called reading and writing simply “English”; today, my son calls it “L.A.” (language arts). Every week, he has a vocabulary packet, writes a reading log, and must complete two iXL online math practice tests. I believe in homework. I believe that repeated practice helps students learn. It also shows parents what children are learning in school. My son is not as happy – the amount of homework sometimes makes him feel stressed and anxious. At least I can help him learn to cope with stress and anxiety. What do you remember most from fifth grade? If you have school-age children, how would you describe your back-to-school experience? I think that public education is a wonderful thing. I think that equal access to education can make the difference between poverty and self-sufficiency. But until I read “Weapons of Mass Instruction: A Schoolteacher’s Journey Through the Dark World of Compulsory Schooling” (2010) by 30-year New York educator and author John Taylor Gatto, I didn’t really think about what public education teaches children and how it influences us. “Weapons of Mass Instruction” questions America’s need for compulsory schooling and provokes analysis of public education. Gatto discusses the history of public education in the US, which began in 1905-1915, heavily influenced by the Prussian education system. He points out that the literacy rate has declined since the 1930s; highlights successful people with “open source” education but a lack of “formal” schooling; and argues that despite “intense forced schooling” there has been a steep decline in common prosperity, and wealth is even more concentrated. Do we really need school? There is a big difference between being “educated” and being “schooled.” “School trains children to be employees and consumers; teach your children to be leaders and adventurers. School trains children to obey reflexively; teach your own to think critically and independently” (page xxii), Gatto advises. We should celebrate drop-outs as brave and self-motivated. “Degrees should never stand as proxies for education” (page 35). What is the purpose of our public schools? Ideally, education would make good people, good citizens, and his or her personal best (page xvi). But in reality, public schooling trains a standardized citizen to be obedient, to conform, and to be separated into classes. It dumbs people down. Students are taught memorization, not critical thinking. Parents are alienated from their children. Schools are a massive jobs program. What does school really teach? It teaches children to wait their own turn, to fake enthusiasm, to know their place/rank in the social order, to follow rules, to be obedient, to be passive, to e afraid of looking bad or different. It teaches that everything is separated – nothing they learn is connected to other subjects or to the real world. It teaches that children and teachers are enemies. And school destroys uninterrupted, reflective time. What if there is no “problem” with our schools? What if they are succeeding at their goals? Public education has social engineered an extended childhood, discouraging responsibility and independence. “We have become a nation of children, happy to surrender our judgments and our wills to political exhortations and commercial blandishments that would insult actual adults” (page xxi). At the same time, public education fosters an acceptance of hierarchy and subordination. How can teachers engage students? As a schoolteacher, Gatto sent students on walkabouts around New York City, so they could write pamphlets and visitors keys by talking with residents and researching history. He had students wrote down three wishes (things they wanted to learn) and three weaknesses (things they wanted to overcome), which gave students “a personal reason to work hard, one that was self-grading” (page 102). What do we need to do about public education? We need a long, loud national, regional, and local debate about how to define an educated person. New schools would eliminate centralized testing, would include the study of vocation (earning a living and contributing to the common good) and death (a natural part of life), and would take place outside of classrooms with flexible schedules. Gatto concludes with an invitation to join an open conspiracy called the Bartleby Project, whose goal is to destroy the standardized testing industry. It encourages students to quietly refuse to take standardized tests by writing at the top of the page, “I would prefer not to take this test.” No group protests or meetings; Gatto encourages peaceful, independent opposition to the test. 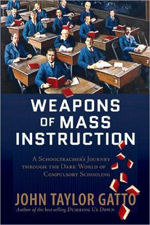 “Weapons of Mass Instruction” is thought-provoking and passionate, presenting a scary and rational explanation for the outcomes and problems with our public schools. Whether you support public education or question its effectiveness, I urge you to think about how and what you were taught in school, and what it is teaching our children. Visit Gatto’s website to find out more about his books and essays, and to join the discussion about public education. I recently read “The Price of Paradise: Lucky We Live Hawaii?” (1992), a collection of 38 short essays discussing Hawaii’s underlying problems and challenges, edited by law professor and author Randall W. Roth. There was only one essay about public education, titled “Public Schools: Why are the test scores of public school children so low?” written by University of Hawaii dean and professor of education John P. Dolly. But for me, it packed a big punch. “The Department of Education must guarantee that students completing certain grade levels will be certified on the basis of performance rather than meaningless test scores and meaningless grades” (page 213), Dolly proposes. The idea of “performance-based certification” of education made me think about my own school experience and what I hope that my 6-year old son can learn from me, from our family, and from his school. What practical, real-world things do you wish you had learned in school? What do you want your children to learn? The primary problem with the Hawaii school system is “the lack of discipline and motivation among students” (page 176), declares Hawaii educator and school counselor Randall Ng. – visits a beloved student who battles kidney failure. Ng is honest, blunt, and apologetic about his methods – at times acting more like a concerned father than a calm counselor. His genuine care, tough love, and willingness to follow his instincts and step out of his office are inspiring and exhausting. Sometimes kids need someone to lean on outside of the home, and they need a tough love approach, Ng reveals. He describes his students with affection and hope, even when he is impatient with them, to make us see beyond the labels of ‘trouble-maker’ or ‘gang member.’ He shows us their home life, and how the lack of discipline at home has affected them. Over the course of his day, Ng reveals his irritation with bureaucrats who aren’t teachers, and teachers who lack relationship skills or who are unable to accommodate fast and slow learners. We learn about his belief in home visits, his conviction that the schools need to accommodate parents who have to work, and his passion for doing whatever works to get through to his kids – whether it’s yelling at them or challenging them. 1. Create small classes of 20-25 students. 2. Return to homogeneous core classes. This is in direct opposition to the trend of heterogeneous classes. 3. Assign 1-2 aides to assist the primary teacher in the core math and language arts classes. 4. Focus on discipline in the classroom. I would add, teach parents to maintain discipline at home. 5. Integrate district resource teachers with the schools and classroom teachers. 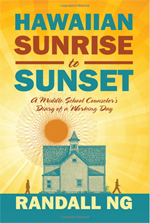 As Ng challenges early in his book, What is the intent and purpose of a middle school? Besides facts and figures, what are we teaching students? Are we supporting them emotionally as well as academically? Teach for America began as an undergraduate senior thesis in 1989. The teacher corps now has more than 8,000 members in 39 cities and rural regions, and more than 20,000 alumni have completed their two-year contracts. After 20 years of building and growing a corps of enthusiastic teachers, Teach for America founder Wendy Kopp has written “A Chance to Make History: What Works and What Doesn’t in Providing an Excellent Education for All” (2011) to share lessons from corps members, alumni, and colleagues about “the problem of educational inequality and what it will take to solve it” (page 3). The book is filled with stories of teachers and schools who are succeeding against the odds, but there is little from students themselves. Kopp acknowledges that “We have pursued all manner of reforms… Sadly, in aggregate, we still have not moved the needle against the achievement gap that persists along racial and socioeconomic lines” (page 6). There are no quick fixes; more funding, technology, charter schools, vouchers, school size, and curriculum don’t guarantee success. Instead, she focuses on things we can change: teachers, schools, a culture of achievement, and community. 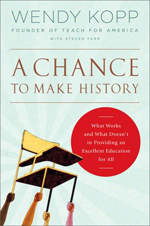 “At the core of the solution to educational inequality is leadership” (page 11), Kopp insists. The book is divided into six sections, covering transformational teachers, transformational schools, improving systems, warnings about silver bullets and silver scapegoats, increasing the pace of change, and transformational change. * Great teachers are effective leaders who try to change students’ lives (trajectories). They have high expectations for their students, with frequent assessments; they maximize every minute and are committed to teaching. * Great schools have an ambitious vision that everyone works toward with excitement and urgency, a culture of achievement, highly effective teachers, a program for “master teachers” to mentor colleagues, effective administrators who recruit and retain good teachers, and a supportive community. * Great school systems invest in teachers, create cultures of achievement and accountability, and have an inspiring vision. Optimistic and practical, “A Chance to Make History” is more of a presentation than a personal account. At times it seems like a promotional story for Teach For America. Ironically, correcting “educational inequality” seems to require a drastically “unequal” effort to make up the difference between low-income communities. “The key to success is local leadership and capacity to employ all the elements of strong vision, culture accountability, and management that distinguish highly effective organizations” (page 141), Kopp stresses. You can read a helpful discussion guide and find out about book events at http://achancetomakehistory.org. To learn about Teach For America or apply to the Corps, visit www.teachforamerica.org. Today, there are “Baby Einstein” videos, “Sesame Street” and other teaching programs on television (I personally like “The Backyardigans” for their focus on imagination and “The Wonder Pets” for their emphasis on helping others and solving problems), Kumon workbooks and Hooked on Phonics, tutoring programs like Mathnasium… And education specialists tell us that early education is critical, and children may never catch up if they fall behind in – preschool! This month, Hawaii Governor Neil Abercrombie announced even more money allocated for preschool education: “The state Department of Education (DOE) is committing $6 million over the next three years for early childhood education as a part of its Race to the Top initiatives… The subsidies will benefit pre-K students living in the “Zones of School Innovation,” which are the Nanakuli/Wai’anae and Ka’u/Kea’au/Pahoa areas.” That’s around $2,500 per year per child. Do you think this is a good use of Race to the Top funds, or federal funds in general? Issue #1: Is early education (2-5 years) nice to have or crucial? Children are able to learn at a phenomenal rate, but some children learn faster and are more interested in learning than others. Are we putting too much pressure on kids to learn, rather than letting them play and socialize with others? Are we under-valuing students who get a “late start” in education by assuming that they can’t catch up, and expecting them to fail? Issue #2: Is early education the parents’ responsibility or the State’s responsibility? 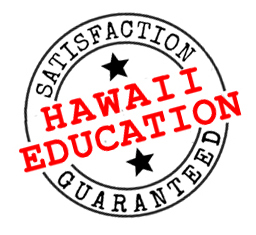 By law,Hawaii offers free public education for Grades 1-12, with additional support for “Gifted and Talented” and “Special Needs” students. If Hawaii is struggling to meet its commitment to quality public education, should Hawaii take on early education as well? Can Hawaii afford it with the current budget crisis – and are taxpayers willing and able to pay for it? Is it the parents’ responsibility to prepare children for school and lifelong learning? My son is five years old, and we’ve been fortunate to be able to be able to send him to preschool. But I didn’t rely on preschool alone to teach him. I chose to spend time with him reading books, writing the alphabet and numbers, asking him questions – and listening to the answers. Does early public education solve a problem in our public school system? Can we afford the government’s solution? What do you think?